Your new facility or renovation will shine thanks to the positive impact of our comprehensive line of wood/laminate lockers. Our locker are beautifully handcrafted in the USA by our superior craftsmen, who have been producing top-quality wood products for more than 28 years. Finish it off with custom branding that serves as a great recruiting tool. 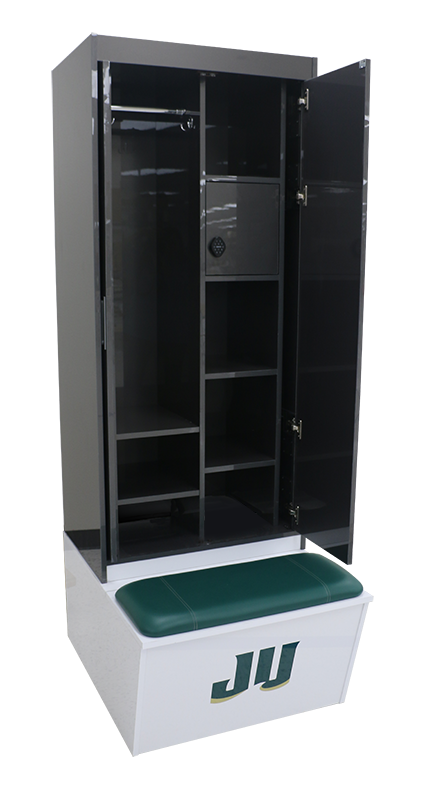 The Athletic Edge’s Armor Elite Lockers are our latest line of lockers bringing THE EDGE to your locker room. These high-end, fully customizable lockers feature the most innovative, unrivaled quality lockers we have to date. When athletes, firemen, EMTs, police and others need a locker that's tough, durable and roomy enough to handle all their equipment and gear, they turn to The Athletic Edge's line of steel lockers. Designed and built by experienced craftsmen with years of experience in millwork and steel fabrication, these lockers exceed our customers' expectations with innovative design and unrivaled quality that meet any size or budget. New in 2015, this aluminum locker line offers durability and a design configuration that allows you to showcase your team pride. The Athletic Edge is the U.S.'s leading emerging manufacturer of custom club lockers with high-end finishes for golf and country clubs, health clubs, athletic facilities, fitness centers, resorts and day spas. Our range of lockers are built for beauty and durability, with custom options to suit any interior needs.